As you can see below, the Grain Exchange Buildings are in a great location in downtown Minneapolis with the Metrodome to the east, the Target Center to the west and Mississippi riverfront attractions to the northeast. The Grain Exchange Buildings are surrounded by government buildings including the Federal Courthouse, Government Center, and City Hall and are also near entertainment hot spots such as Guthrie Theater, Orchestra Hall, Mill City Museum and Orpheum Theatre. The buildings are in an ideal location to do business in Minneapolis. 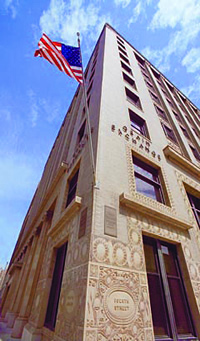 The Grain Exchange Buildings are connected to the downtown skyway and tunnel systems, adjacent to two parking ramp facilities and located on or close to Metro Transit buslines and the light rail system. There is also easy access to three major interstates, I-94, I-35W and I-394. For a detailed map including nearby locations and the skyway system, click here.